British finance minister Philip Hammond warned rebels in his Conservative Party that he would have to quickly reverse plans to ease nearly a decade of austerity if London fails to get a Brexit deal. Hammond, who is due to announce an annual budget plan on Monday, said he would be able to show voters that "their hard work has paid off" as long as Britain achieves a smooth exit from the European Union in five months' time. Hammond has angered many members of his Conservative Party by arguing Britain should remain close to the EU after Brexit and Prime Minister Theresa May has so far failed to bridge the divide in her party. Many investors and businesses are worried that the chance of a no-deal Brexit is growing. Hammond said he was confident that London and Brussels would settle their differences but "if we don't get a deal ... we would need to take a different approach to the future of Britain's economy." 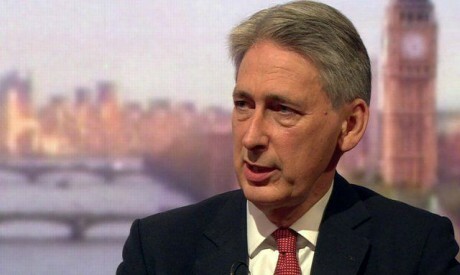 "We would need to look at a different strategy and frankly we'd need to have a new budget that set out a different strategy for the future," Hammond said in an interview with Sky News broadcast on Sunday. Most economists say Britain would suffer an economic shock if it leaves the EU with no deal. The British pound sank to a two-month low against the dollar on Friday and was weaker against the euro. But Jacob Rees-Mogg, a leading pro-Brexit lawmaker in the Conservative Party, downplayed the economic risks of Brexit. "The Treasury has rather embarrassed itself, has a lot of egg on its face from getting its Brexit-related forecasts so wrong so far and I think there is an element within the Treasury that is still grumpy about Brexit and that's a pity," he said. In his budget on Monday, Hammond is expected to announce a further improvement in Britain's borrowing projections, giving him a bit of room to ease nearly 10 years of steep cuts in many areas of public services. But despite the budget deficit falling sharply, Britain's debt levels remain high, limiting how much Hammond can relax his spending squeeze. He said on Sunday that the biggest increase in spending in his budget had already been announced when May said four months ago that more money would be earmarked for the health service. On Monday, he is set to announce other measures including more spending on roads to ease congestion and a tax cut for small retailers to help them compete against online competition. He hinted on Sunday that he would provide money to soften the impact of changes to Britain's welfare system. Hammond said the Bank of England as well as the finance ministry would have to take action if there is a no-deal Brexit. In the short term, Hammond said he could use some of the breathing space he has kept for himself inside his fiscal targets to help the economy.